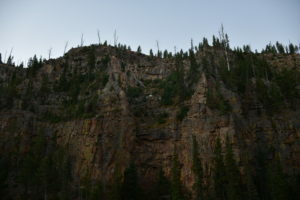 In July 2000, I climbed into the back of my parents’ Orvis edition Jeep Grand Cherokee, with only a Caedmon’s Call cd and a stack of bridal magazines to entertain me on the 25-hour drive from Dayton, Ohio to West Yellowstone, Montana. Newly engaged, I wanted to take this one last trip with my parents. 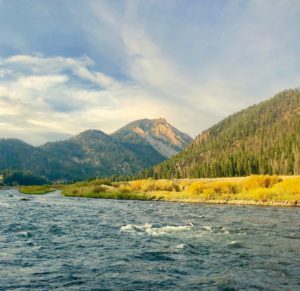 I expected to see “mountains and stuff.” I didn’t expect to begin a life-long love affair with Montana–the last best place. This past Labor Day, I headed back to the place my father introduced me to, on what would have been his 75th birthday. I stayed at Campfire Lodge, the same resort I visited that summer. 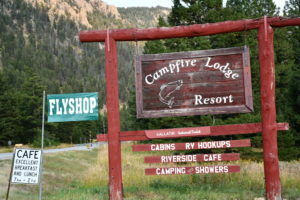 Campfire Lodge also happens to be the setting for my novel, Mayflies on the Madison, a rustic romance woven with redemption and enduring faith. 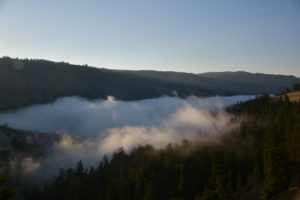 Just twenty minutes away, across the Wyoming state line, I entered Yellowstone National Park before sunrise. 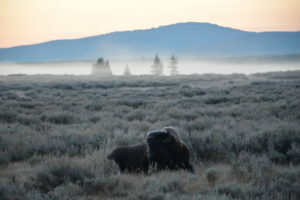 Frost-covered bison awaited the dawn. 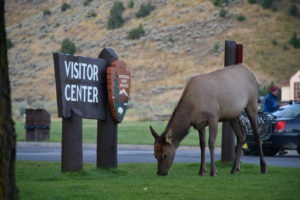 Elk grazed on riverbanks, ignoring the clicking of tourists’ cameras. 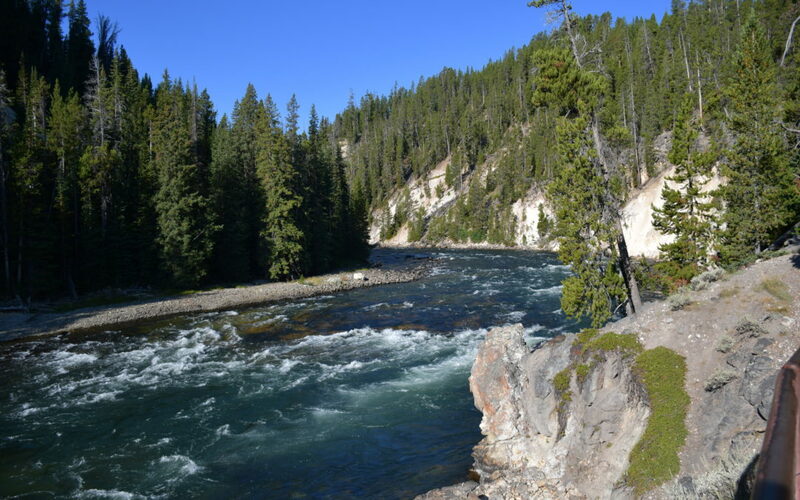 Grand Canyon of the Yellowstone, and listened to the symphony of the Madison River…like for hours…without talking. It was a Labor Day miracle!! 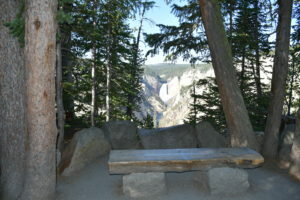 My characters might kiss on this bench… a lot. Don’t judge them! Check out this rockface. Do you see that white thing? Yep, that’s a mountain goat and its baby. 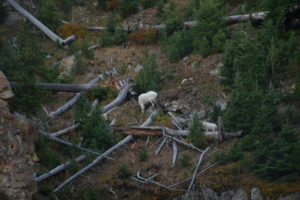 Funny fact: Mountain goats are not native to this area, but someone decided that mountains should have mountain goats, so they added mountain goats. Uh, okay. You know what is native to this area? Grizzly bears. 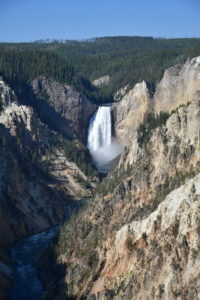 But, after visiting Yellowstone probably ten times, I’ve still never seen a grizzly. 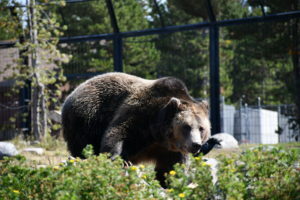 So this time, I marched myself right into the Grizzly and Wolf Discovery Center, paid $13 and saw my grizzly. Thanks for visiting Montana with me! I love all the pictures. I have yet to ever visit Montana but someday I will until then I just read your stories. Janell, I’ll meet you there! …And that it’s the setting for your novel! Great idea!! Thanks, Jenny! Montana is all kinds of pretty, right?! And I’ve only seen a small part of it. One day, I’ll get up to Glacier National Park! That’s a bucket list item for me. Thanks for the comment!